This week the American Congress of Obstetricians and Gynecologists issued a strong warning about the risks of environmental toxins to pregnant women and fetuses. For years, the debate over restricting the stew of industrial chemicals that we live in has suffered from a case of he said, she said. 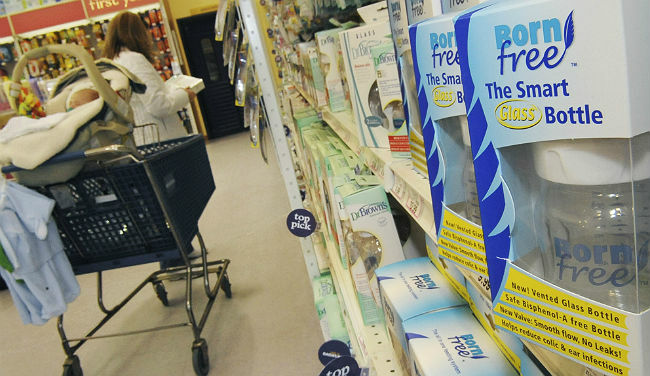 Environmental groups sounded the alarm about the thousands of chemicals in our air, water, food, housewares, and shampoo that science suggests — but doesn’t outright prove — could make us sick. They warned about such commonly used substances as BPA (in cans and plastics), fire retardants (in furniture), and phthalates (in cosmetics). Chemical industry representatives countered that there is no clear evidence that their products are unsafe, and tighter regulation would squash innovation. But now it’s about pregnant moms and unborn babies. For the first time ever, the American Congress of Obstetricians and Gynecologists (ACOG) this week came out with a strong statement about the risks of environmental toxins to pregnant women and fetuses. Also for the first time, the group is going so far as to urge individual doctors to advocate for policy changes to protect women and babies from exposure. “The scientific evidence over the last 15 years shows that exposure to toxic environmental agents before conception and during pregnancy can have significant and long-lasting effects on reproductive health,” wrote ACOG. Another group of reproduction specialists, the American Society for Reproductive Medicine, co-authored the opinion. The medical groups cite what they term “sufficiently robust” research showing associations between chemicals in our everyday environments and awful outcomes such as miscarriage, stillbirth, premature birth, childhood cancers, birth defects, and cognitive impairment in children. And they thus add their voices to those of other medical groups, including the American Academy of Pediatrics and the Endocrine Society, that have publicly called for stronger regulation. Part of the challenge is that it’s ethically problematic to do the most rigorous studies, randomized controlled trials, for environmental health. You couldn't, say, deliberately expose Cleveland, but not Columbus, to an air pollutant for 10 years and then compare how the two populations fare. You can observe correlations between naturally occurring chemical exposures and human health, but these can take decades to become clear — by which time the harm may already be done. So, say the doctors groups, you have to rely on animal studies and other research in the lab. The central question is how much evidence is enough when it comes to protecting our health. Science is always messy. It’s rarely possible to say that any given conclusion is unequivocally, 100 percent certain. So at what point on that murky spectrum do we decide to act? And, critically, who has the burden of proof? At the moment, the burden is all on the U.S. government, yet the law gives it little power to intervene. The Toxic Substances Control Act was passed nearly 40 years ago and allows new chemicals to go essentially straight to market for use in everything from food packaging to nail polish — no systematic safety review required. Only if the Environmental Protection Agency independently demonstrates that a substance is dangerous can it request safety data from the company. Thus, whereas pharmaceuticals go through rigorous, public study before they’re ever sold, “The exact opposite is true with chemicals. Chemicals are released into the environment and then they have to be studied,” says ACOG’s Conry. Everyone — environmentalists, doctors, and even the American Chemistry Council — says the law is too weak and must be changed. But how much? “Going back pretty far, the industry has basically won the day with the idea that chemicals should be treated as innocent until proven guilty,” says Gerald Markowitz, a health historian at City University of New York’s John Jay College. The late Senator Frank Lautenberg introduced the first version of the Safe Chemicals Act in 2005 and then proposed it repeatedly, never gaining bipartisan support. His bill would have required chemical makers to prove their products’ safety before selling them. Before Lautenberg’s death this year, he finally created a bipartisan version with Senator David Vitter, stripped of many of the health protections in the original. The new bill stalled when environmental groups slammed it as an industry bill with a weak safety standard. The next move now belongs to the chairman of the Senate’s Environment and Public Works Committee, Barbara Boxer. Will a statement this strong from the doctors who care for the nation’s pregnant women be enough to shake up the long stagnation in Congress? It fuels the momentum already building for a modern law, says Markowitz, the health historian — momentum that has sprung from the combination of recent science, Lautenberg’s bills, and growing public concern. So, yes, change is coming, both White and Markowitz believe. But neither would hazard a prediction on when.